We are sure you would agree that the Triumph Thruxton R is one gorgeous motorcycle and we all want to own one, if only money was not a concerning matter. But then how do you transform an amazing retro-classic into an even more special motorcycle? Make it in limited numbers and let only a select few experience it while others can dream about it. We believe that was the brief given to the enthusiasts working at Triumph's in-house custom motorcycle division called the Triumph Factory Custom a.k.a TFC. The images that you see below are that of the Triumph Factory Custom Thruxton that was recently unveiled by the British motorcycle manufacturer. And yes, it will be on sale. But only 750 units will be made, each priced at $21,500 (Rs 15,32 lakh, excluding tax and duties). 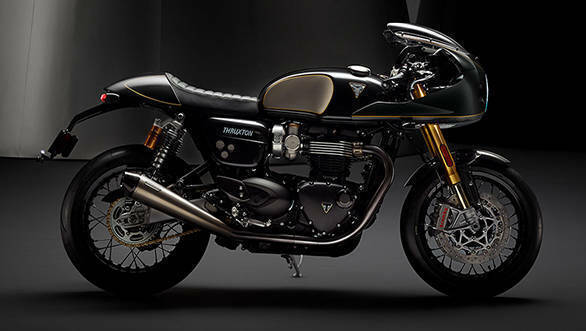 For starters, the TFC Thruxton comes with TFC badging and instrumentation with gold detailing. Additionally, it gets individually-numbered plaque on the top yoke. 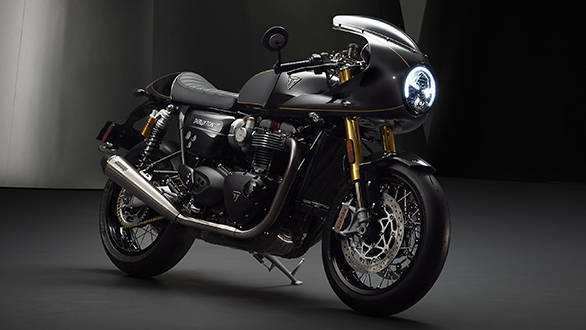 Also, all the Thruxton TFC owners will be given a special tailor-made TFC kit that will be unique to their motorcycle consisting of numbered letter signed by Triumph's CEO Nick Bloor, a personalised custom build book, and a beautiful Thruxton TFC bike cover. To make it lighter by 5kg than the standard R, the TFC Thruxton is equipped with a lightweight carbon-fibre bodywork, including a stunning one-piece carbon cockpit fairing, front mudguard, seat cowl, heel guards and silencer end caps. The factory custom also gets billet machined aluminium top yoke with TFC branding, premium brushed nickel mirror centres, tinted screen, black anodised multi-spoked wheels, black Ohlins RSU springs with black decals, black engine covers and a black tail tidy. 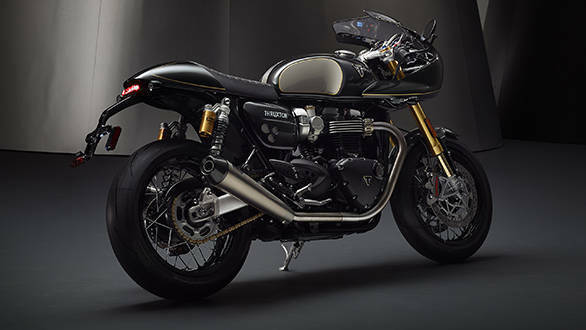 The TFC Thruxton comes in a unique Carbon Black shade with brushed tank knee pad detailing, and hand-painted gold lining. The equipment list on this machine also includes flip-top Monza fuel cap, twin throttle bodies with brushed intake finisher, Daytona R footpegs and anodised aluminium swingarm. In comparison with the standard 1,200cc Bonnveille engine powered ThruxtonR, the TFC Thruxton makes 10PS more at 107PS and generates 115Nm. This has been achieved with the help of lighter weight engine components, high compression pistons, and revised ports and cam profile. Also, it gets three upgraded riding modes Rain, Road and Sport unique to the Thruxton TFC that adjusts throttle map, ABS and traction control. Triumph also claims that the TFC Thruxton gets a one-of-a-kind exhaust system using Vance & Hines titanium silencers and carbon-fibre end caps. Braking duties are taken care of by Brembo four-piston M4.34 radial monobloc calipers and twin-floating Brembo front discs.